Besides running and cheering on the marathoners. I have been cooking and eating. It is my all time favorite season. The leaves are changing. The air is comfortably breezy and crisp. Lucky us! We have been having some absolutely beautiful FALL days here in Washington, DC. And although it hasn’t been too cold yet, I am still craving everything fall. One thing that defines fall is butternut squash. When I was growing up it was a special treat that my mom made only at Thanksgiving, but now it is a staple in my house. I love everything about it. I eat it all different ways, but my favorite way is in soup form. That is why when I came across the Butternut Bisque recipe in the cookbook Isa Does It, I knew I had to make it asap, plus its Vegan! Brush the parchment paper with olive oil or coconut oil and place the squash pieces cut side down. Roast for 45 mins. until squash is tender. After squash is cooked let cool and continue with the soup recipe. If you are making squash in advanced, refrigerate the squash until ready to use. Preheat a 4 quart pot over medium heat, add coconut oil. Cut up onion, and add to the pot, saute until caramelized. Add white wine and deglaze bottom of the pan, by scraping with a wooden spoon. Add squash to the pot. After everything is heated all the way through, add soup to you Vitamix. I actually use the soup setting, which continues to heat everything. Blend until smooth. If you are using a Vitamix it shouldn’t take long. 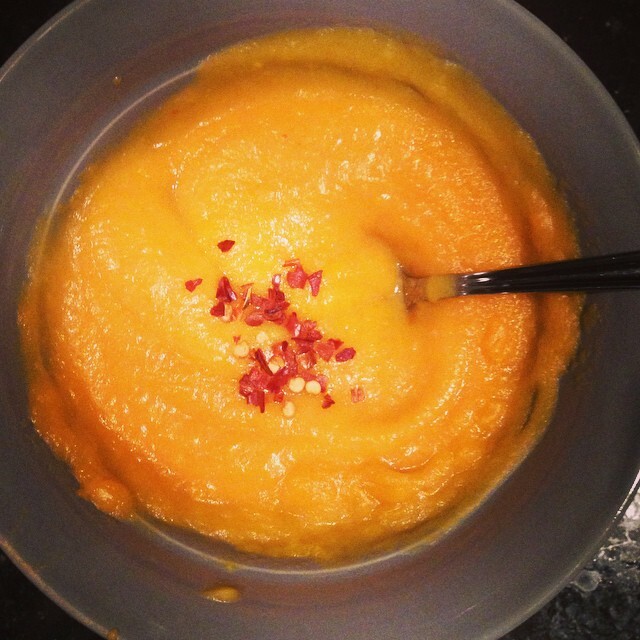 Pour bisque into a bowl, sprinkle with red pepper flakes and swirl coconut milk on top. What is you favorite way to eat butternut squash. I would love to hear from you. Let me know what you think about this recipe.